'We are not running away from responsibility"
The News on Sunday: How do you see the politics as it unfolds today? Ahsan Iqbal: Feb 18 election is a watershed in Pakistan"s politics. People of Pakistan have brought about a ballot box revolution. This was unthinkable on Feb 17. People showed great maturity. Despite all threat of terrorism, they came out and used the power of the vote to bring about a democratic revolution in Pakistan against dictatorship. People have rejected the president by rejecting his King"s party. They have also split the mandate in such a manner that it has locked the two mainstream parties in a position of interdependence. No major party has any other option but to work with the other major party. For the first time the administration of Darul Uloom, Deoband, India, the 150-year old seminary that is considered the spiritual home for the Deobandi school of Islam, has categorically denounced all forms of terrorism as un-Islamic. This venerable old Sikh gentleman walked into a cafe and sat himself down at a corner seat. The waitress brought him a cup of tea and he stirred it for a while and then took a sip, and shook his head. Then he stirred it some more, much more vigorously, tasted it, and shook his head again. Then he took up his spoon again and this time went at it hammer and tongs, stirring until the rafters shook; then he sipped it again, shook his head and clucked his tongue and muttered to himself, "Well, this much at least seems clear, if you haven"t put any sugar in in the first place, no matter how long and hard you stir it, it doesn"t get sweet!" It has been exactly a year today since President Musharraf ousted Chief Justice of Pakistan (CJP) Iftikhar Muhammad Chaudhry in an act condemned widely within the country and abroad. What followed is everybody"s knowledge; the deposed CJP refused to budge and defied all unconstitutional orders aimed at undermining the independence of judiciary. 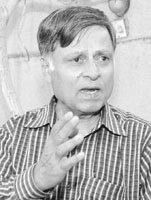 Senior journalist and former president Pakistan Federal Union of Journalists, (PFUJ) Ahfaz-ur-Rahman has to his credit as many as 18 books and translations and is equally inspiring for his struggle for press freedom and implementation of Wage Board Award. Nobody knows it better than people in this country, the difficulties of obtaining a visa to travel overseas. This hardship becomes almost too burdensome to bear if the visa in question happens to be for a European or North American country. Ordinary Pakistanis have probably suffered the most because of the terrorist acts of their apparent brethren in faith. Many countries have imposed stringent conditions on travel to them -- and perhaps for good reason because one wouldn"t want to have visitors who want to attack and kill your citizens or destroy public property. TNS: Isn"t that an unintended consequence of the election? AI: Yes, but this is the outcome and the parties cannot walk out. It is good for the country because with a coalition of major parties, you can bring about a transformative agenda, which probably no single party can bring by itself. There is a real opportunity for a truly reformist government, for bringing back, judiciary, supremacy of constitution and supremacy of parliament and also depoliticising the military -- in short the Charter of Democracy (COD). The two parties will have a common minimum agenda but it will have tremendous power behind it. TNS: How do you explain the term coalition, considering that PML--N apparently only wants to support the PPP and not accept ministries? AI: The mechanics and modalities of the coalition are being worked out but there is certainly a consensus and agreement on the basic principles. TNS: But what does PML--N have against a coalition government? AI: Our original idea was that we must respect each other"s mandate, as per the COD. We thought that since PPP emerged as the single largest party in the centre, so we were willing to recognise their mandate and allow them to form government at the centre and go ahead with their policies, similarly in NWFP and elsewhere. TNS: How do you then implement the 'reform agenda" that you were talking about? AI: We will help them, it is their mandate. But now PPP feels that we must also join the cabinet. We have no objection to that. We are only working on a few points, which if we do not address can then create problems later. For example, for us, the restoration of judiciary is fundamental and critical. PPP has agreed in principle and we need to sit down with them and find a timetable, because if this thing lingers and if we are sitting in the cabinet and the lawyers are agitating outside, we will come under tremendous pressure. At that time, if we quit the cabinet, it will break the coalition. TNS: So by not sitting in the cabinet, you want to become a pressure group yourself for the PPP government? AI: No. We have no objection to joining the cabinet. TNS: Please clarify this regarding the restoration of judiciary because one of your MNAs-elect said on television the other day that in order of priority, PML-N will go for removal of 58-2 (B) one, impeach or remove the president two, and restore judiciary three. AI: No for us, the restoration of judiciary is the first priority. Because for example, if you remove 58-2 (B) from the constitution and there are no independent courts, and the existing Supreme Court says that this is null and void and parliament has no authority, you will have a new crisis. So for parliament to work according to the constitution, independence of judiciary is paramount and prerequisite. Both PPP and ANP have said that they support it, only modalities remain. Our view is that this was an unconstitutional act done through an administrative notification, and a lawful notification can reverse this. PPP says we should move through parliament, we have no objection. But about one thing we are very clear, under no circumstances do we need two thirds majority to undo the Nov 3 action. Because when the parliament comes into being, any extra-constitutional action of a dictator must come before it for ratification. If the parliament rejects this extra-constitutional action of Musharraf, it will have no legal meaning. TNS: So you see a crisis in the making? AI: If Musharraf"s unconstitutional action could take place at the spur of the moment, to correct it you do not need a complicated mechanism. TNS: But as long as he sits in the presidency, the possibility of confrontation remains? AI: The point to understand is that on Feb 18, people have not given their verdict against PML-Q, they have given verdict against Gen Musharraf. He has to now accept responsibility for the election results and step down -- to allow the country to move forward. If he tries to linger on, he will create a parliamentary crisis, just as he created a judicial crisis for the country. Pakistan needs a break from the past. Right now the presidency is becoming the centre of controversies. TNS: So under no circumstance do you see Musharraf sitting in the presidency along with this parliament for the next five years? AI: I see this parliament continuing for five years but I do not see Musharraf sitting in the presidency for any longer than a few weeks or months. TNS: Is that a wishful dream? AI: No this is the reality because Gen Musharraf cannot axe the new parliament under article 58-2 (B). The mandate of the people is very strong. One man has already destroyed the judiciary; he cannot now go against the verdict of 160 million people, just because he is threatened. He has to go. People of Pakistan have endorsed the opposition"s point of view that rejected Gen Musharraf"s election as president. That has nullified his election. Now you have another situation. He does not command majority in any of those five new assemblies which form the electoral college for the election of the president. The writing on the wall is clear. If he can step down with grace, that will save Pakistan from another crisis which it cannot afford at this time. If he resigns, the political parties will be willing to give him some safe exit. TNS: How natural or sustainable will be the coalition between PPP and PML-N which are natural political rivals? AI: An example of such a coalition between two major parties for a reform agenda you can find in today"s Germany, where SDP and CDU, who have been arch rivals for decades, are now sitting in a coalition. Because they realised that the economic competitiveness of Germany was under threat in the European Union, so they joined hands for unpopular economic reforms which no single party could push. This coalition is running successfully for the last three years. We have a similar model emerging in Pakistan, where the two major parties are coming together to give this country strong foundations for constitutionalism and democratic governance. It will be a major contribution if this coalition could achieve this. TNS: Do you seriously think all this needs a five year period? AI: Once these constitutional amendments are introduced, you certainly need to consolidate the democratic system. There is a chance that any extra-constitutional action can reverse all that has been gained. TNS: If the idea is to move to a two party system, what are you going to tell your electorate at the time of the next election? AI: Even within a coalition people can judge and this will create a healthy competition. This is a more complicated and competitive game than playing adversary to the other party. This is as complex as two 'saukans" existing in one house. This puts you on high alert, mindful of your performance all the time, because while you are collaborating, people are also judging you in a comparative framework. TNS: There is skepticism about your maneuvering in Punjab which indicates that you want to form the government alone? AI: No, despite having the numbers we would include PPP as our ally in the Punjab government, because we want to build confidence in this system. More so because it is a period of terrible crises and we want to offer our sincere support. TNS: But you also have to share responsibility. AI: We are not running away from that. Our only consideration is restoration of judiciary. We are hopeful that once we find a solution to that we will not mind joining the cabinet. TNS: How is Mian Nawaz Sharif going to return to active politics in the presence of all the cases and convictions? AI: We think that after Feb 18 the mood of the administrative machinery will also change because they were victimised on political grounds to force the PML-N to boycott the polls. TNS: What about the common perception that in the running of the party affairs, the Shahbaz Sharif group has taken over and is calling the shots? AI: Factionalism is very common in any major political party. Major parties do have different interest groups, lobbies and they compete and this is very constructive for the party. This whole controversy that Shahbaz Sharif had a different doctrine of politics was disinformation and it has been proved in the last eight years that he has always believed in the politics of Mian Nawaz Sharif. TNS: How is the centralist PML-N (which has been aligned too much with Jamaat-i-Islami) going to co-exist with the progressive PPP and ANP? AI: I think it is not fair to compare PML-N with JI. We do have a strong pro-business approach in our economic agenda but at the same time our social programme, which Nawaz Sharif implemented in his two tenures as prime minister, has great respect among poor peasants and workers. We have become a very strong democratic party in the last eight years. We are not apologetic on religion and our Islamic identity. Our vision of religion is one, in which there is no discrimination; every Pakistani has full citizenship. We think that Islam is a very progressive religion, its system of social justice can bring solutions to our economic ills, including poverty. The seminary has strong influence on thousands of Deoband madrasas (in Pakistan alone there are more than 10,000 Deoband madrasas with 1.6 million students. Majority of these madrasas were created during the Zia regime (1977-88) and the students of these madrasas were used to fight the Soviet Union in Afghanistan) in the subcontinent and Afghanistan. Deoband is the source of inspiration for many groups busy fighting against security forces in Pakistan and Afghanistan including the Taliban. The declaration was issued on Feb 25, during the All India Anti-terrorism Conclave that was attended by more than 15,000 clerics all over from India. The message was clear-cut. "Islam preaches the tenets of peace, justice and brotherhood. There is no place for terror and violence in Islam," said the Darul Uloom vice-chancellor. "Even the faithful and right-thinking Muslims are living in fear, because of some who think they are serving the faith by perpetrating violence. Allah will never have mercy on such elements," he said. When he was asked whether suicide bombings were included in its definition of 'terror acts", he said: "All forms of violence used to kill innocent individuals." As the majority of the people and groups including the Taliban fighting against security forces belong to the Deobandi school of thought, this fatwa may lead them to redefine their acts and role in the war against terrorism. The leading Deoband Ulema in Pakistan think that any declaration from Darul Uloom has its influence on Deobandis in general in Pakistan "Darul Uloom, Deoband is considered as the mother of all Deoband madrasas and we agree with its declaration or fatwa in every respect and if some Deobandi does not accept their fatwa, we do not consider him Deobandi," said Mufti Mohammad Naeem, Principal Jamia Binoria Karachi and member Majlis-e-Aamla of the most important Deoband madrasa board, Wafaqul Madaris Al Arbia Pakistan. He blames Gen Ziaul Haq for the current wave of extremism. "He trained people (then they were Mujahidins) in the early 1980s to fight against Soviet Union. After its defeat another war in Afghanistan between Persian speaking people and Pashtoons started. The Pashtoons named their force as 'Taliban" during that war and that was how the Taliban came into being. Taliban does not mean students of madrasa but the word is referred to the student in general in Persian. We (Deobandi madrasas) do not have any link with organisations like the Taliban or al Qaeda. Osama got his education from some American university" he told TNS. Mufti Naeem admits that some people fighting against security forces might be students of some madrasa but that is their individual act. " A madrasa does not train students to kill people. If a student of some American university kills 15 innocent people (which they usually do) nobody alleges the university for his/her acts; the same should be the case with a madrasa student in Pakistan," he said. When told about Qazi Usman"s (Deputy Rector, Darul Uloom Deoband) quote in the Indian press, "We want to say that what happens in Pakistan madrasas is their business. We are keen to make it clear that killing innocents, let"s say someone walking on the road, is not justified in Islam," Mufti Naeem retracted and said "There may be two or three madrasas on the Pak-Afghan border involved in training their students for conducting terrorism, but it"s the government"s duty to find out the fault. The government should review its policy and should talk to them. Missiles never end violence. The government should also make the fatwa of Darul Uloom public on a very large scale if it wants to extract some benefit out of it." But the leaders from FATA do not buy the argument that the fatwa might influence people who have already made up their minds to kill others. "For them Deoband and non-Deobands are equal and they are least bothered to listen to any advice," said Senator Maulana Saleh Shah from North Waziristan, while talking to TNS on phone. He said that the West is using the term 'terrorist" against Mujahideen. "So far not even a single person has admitted that he is a terrorist. There is a big difference between a Mujahid and a terrorist and referring to Mujahideen as terrorists is very unfortunate." Senator Shah added that so far he has not seen any madrasa in tribal area or in other parts of the country where students are given military training. According to him, the ground realities in Pakistan are completely different. "When people ask Mujahideen why are they targeting the Pakistani security forces, their reply is that since Pakistan is a coalition partner of US in this war, so for them all partners such as Pakistan, Australia, Canada, and US are equal." According to him, the local Taliban have repeatedly said that they are not attacking but they reserve the right to defend themselves. Experts believe that the Darul Uloom Deoband"s fatwa may not influence the people fighting against the security forces in Pakistan or Afghanistan. "The influence of this declaration or fatwa, unfortunately, would not hold in the on going terrorism in Pakistan," said renowned hournalist Ahmed Rashid, an expert on terrorism and Taliban. According to Rashid, the new government should seek help from leading Deoband Madrasas in Pakistan like the Jamia Banoria, Karachi and Jamia Haqqania, Akora Khattak to get a fatwa issued against terrorism and suicide attacks. "This would help in minimising this phenomenon of suicide attacks in Pakistan." Ahmed Rashid believes that a new generation of young people from NWFP and FATA, impressed by the ideology of al Qaeda and the Taliban, are involved in this war. " The majority of them have fought in Afghanistan and Kashmir with the Taliban or other militant groups. Majority of them have probably never been students of some madrasa but they have their own leadership, whose ideology is not based on any religious thought but on militancy." Believe it or not, that is the first thing that comes to mind whenever I begin to say my two bits worth on your present political predicament! Because that is what it is, a predicament and not a situation. But first a few disclaimers. I am a sober and rational person, and I believe not only in the people"s right to have their way, but also in the essential wisdom of the people, and that faith remains and in so far as the people have expressed their will something good must come of it. And yet, I must admit that the faith is wavering just a wee bit. Just think; we have just had a peaceful, clean and clear election after months of the most bloody minded suspicions and accusations, and in one day the people have shut the mugs of all those mucking around with anticipations of rigging and manipulation. And yet, what exactly have we achieved? This was an election in which everyone"s favourite party has come out a winner, and yet a week later we still do not have a viable candidate for prime minister, or any of the chief ministers for that matter. And not even the furthest seeing seer can tell how the situation is going to resolve itself. And the speculation is passing all bounds of the ridiculous! If the Queen of England ever heard that the Conservatives and Labour were talking of forming a coalition she would fall off her throne and kill herself laughing. If you don"t believe me just think what you would do if you found out the Republicans and the Democrats in America were fielding a joint candidate for President! I think the whole world would think the yanks had gone crazy and die laughing. And yet, a similar possibility is not only being talked about, it is being touted as the great bit of political wisdom. The defunct leaders of the two great parties have picked up during their years in the wilderness. And no one is laughing! Just in case, if in your euphoria you have forgotten our way of political thinking, let me remind you. A coalition is formed when a plurality party finds it does not have the majority to push its programme forward, so it forms a coalition with a small strength by promising a certain share of power with it. In our case when the PPP in the past found it was half a dozen people short, it formed a coalition with Mr Nakai -- by handing over the chief ministership and the province to him! We are going even further this time by forming a coalition of the two plurality parties. Pardon my French but one can only surmise it is for the purposes of thuggery! The lawyers community launched an unprecedented movement the day the CJP was removed and met with success when the Supreme Court of Pakistan restored him to his post. But this success was short-lived as President Musharraf once again tried to usurp the independence of judiciary by proclaiming emergency in the country on Nov 3, 2007 and sending 60 judges of the superior judiciary home. Such extra-constitutional steps by dictators are not new to this country, but it is the first time such a large number of judges have refused to succumb to any pressure whatsoever. The situation on ground is that with every passing day the demand for restoration of judges is getting stronger. The movement has got an impetus after the general elections of 2008, in which the people of Pakistan have rejected President Musharraf"s policies and voted against the party that had his unlimited support. The success of democratic forces in elections, easing of restrictions on stalwarts of the lawyers" movement and mysterious silence of the president"s legal team are signs that hint at some change which seems to be round the corner. In the midst of these developments, different methodologies as to how to restore the judges are being discussed at length. There are those who are suggesting that mere physical restoration should be demanded because the deposed judges do not need to be restored legally. The point is that the charges "that some members of the judiciary are working at cross purposes with the executive and legislature in the fight against terrorism" very well explain that Musharraf"s purpose behind this move was nothing else than to extend his tenure. On the possible ways to restore the deposed judges, Faisal Siddiqui Advocate, a Karachi based lawyer tells TNS that the solution is most likely to be political than legal. Faisal has worked on likely solutions with ex-SCBA president Muneer A Malik and says the restoration can come as a result of an executive order passed in this respect, through resolution in the national assembly, rejection of a bill presented before the house to endorse steps taken by President Musharraf on Nov 3 and afterwards, a constitutional amendment or even a constitutional package. But this is for sure that the decision will have to be taken by the political parties as to which method are they going to adopt. Faisal says all the democratic political parties are clear that they are going to do their best to ensure the independence of judiciary. They do not want to enter into confrontation with the president but take the matter to the parliament. "After all there is a theoretical possibility that President Musharraf can even go to the extent of dissolving the assemblies. I think we must not take this issue lightly. His track record shows that he can take as devastating a step as one can think of," he adds. President Supreme Court Bar Association (SCBA), Aitzaz Ahsan, however, thinks that an executive order is the simplest way to restore the judges. He says two-thirds majority in parliament is not required at all for reinstating the deposed judges, including the deposed CJP. Aitzaz says the new government once it is formed can simply pass an executive order without proving two-thirds majority in the parliament. Pakistan Lawyers" Forum (PLF) President A K Dogar says that his organisation has suggested that "the incoming parliament, which commands comfortable simple majority can enact a legislative measure entitled Judges Restoration Act 1 of 2008." This Act of the Parliament should take effect through the Council of Ministers headed by the prime minister, who is the chief executive of the country and a notification could be issued by the Ministry of Law and Justice and be sent for formal signatures of the President of Pakistan who is bound under article 48(1) to affix his signatures on the said notification, he adds. Deposed chief justice of Peshawar High Court (PHC), Tariq Pervez Khan, also suggests an executive order as a means to restore the deposed judges. His point is simple; the judges who have been removed through an executive order simply need another executive order to get restored. On the other hand, former federal law minister, S M Zafar thinks the restoration of the judges deposed on Nov 3 can only be resolved by the next parliament. In his view, an administrative order is not enough to undo the ruling of the Supreme Court of Pakistan that declared the steps taken on Nov 3, 2007 legal. "It"s only the parliament with a two-thirds majority that can reverse the Supreme Court ruling." Born on April 4, 1942 in Jabalpur, India, Rahman"s family migrated to Karachi in 1947 when he was five. 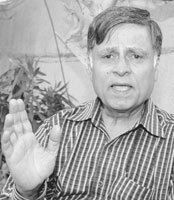 He passed his Matriculation examinations from Delhi Punjab National High School, Bazarta Lines, and graduated from Urdu College in 1962. While still in high school he won the first prize in a competition for his article 'Gandum kay khet, bachon kay haath aur shair," organised by well known literary magazine Afkar and for 'Paighamber kay naam" an article on the writings of Krishan Chander in a competition organised by Indian literary magazine 'Shair". Inspired by Sahir Ludhyanvi, Krishan Chander and other stalwarts of the Progressive Writers" Association (PWA) since his school days, it should not be astonishing that he emerged as a student leader of the left-wing student organisation, National Students Federation (NSF) and participated in 1962 and 1964 student upsurges against General Ayub Khan"s regime with zeal. "The students in yesteryear were an important part of the intelligentsia and played a vital role for educational reforms and democracy. Unfortunately, ethnicity replaced these ideals when General Ziaul Haq banned student unions in 1984," said Rahman. He recalls that the writings of Sahir and Krishan Chander inculcated in him a strong urge to fight against exploitation and taught him that life has a meaning. The lofty ideals of a society free from exploitation continued to be his motto when he joined journalism in 1966 as a sub-editor in the weekly Akhbar-e-Jahan. Thereafter he worked for several publications including Musawaat, Jang, Amn and the weekly Al-Fatah in senior positions such as magazine editor and assistant editor. 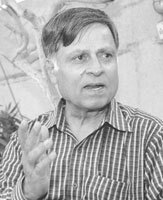 He also worked as Editor Urdu Section, Foreign Languages Press, Beijing, People"s Republic of China during 1969-1972 and 1985-1993. Asked how he compares the present-day journalism with that in the 1960s, he said that previously there was a lot of emphasis on ethics. "The institution of working editors was alive and journalists had to read a lot to produce a good copy and they respected their seniors. Today we find deterioration of values and journalists, especially in Urdu journalism." Rahman laments the fact that today there are no follow-ups and research despite the fact that the Internet has provided a great opportunity to acquire knowledge free of cost. "Previously everybody was committed to the journalists" movement probably because there was a student movement that inculcated commitment at an early age." With respect and fondness, Rahman recalls that veteran journalists such as Eric Cyprian, Minhaj Barna, MA Shakoor, Ahmed Hasan and others were arrested as early as 1954 when they defied the notorious 'Security of Pakistan Act." "PFUJ was established in 1950 and from day one, journalists struggled under its banner for press freedom and better wages and challenged anti-democratic forces and black laws." Rahman recalls that in 1970, journalists from the then East and West Pakistan launched a massive movement for interim relief and their strike was so successful that no newspaper was published for 10 continuous days. "Nobody was sacked in East Pakistan but as many as 250 journalists were thrown out of their organisations in West Pakistan and their jobs were restored only when Prime Minister Zulfikar Ali Bhutto took hold of the reins of power in 1972." The second phase of journalists" struggle started in 1977, when the daily Musawaat, Lahore, a newspaper with PPP leanings, was banned by General Zia"s government. "We volunteered arrests and summary military courts issued orders of rigorous imprisonment for many journalists. Three of our colleagues were even flogged," he laments. "I was in Camp Jail, Lahore, and was banned from the Punjab province for six months.". "The third phase of our struggle began in July 1978, when the daily Musawaat was closed again. Again we volunteered arrests. In the initial period, four journalists volunteered arrests daily. Then a group of four people, including a journalist, an industrial worker, a farmer and a student would volunteer arrest and our struggle continued for 100 days.I went underground and organised that movement and I had to change 30 hideouts to escape arrest during that period.". Asked why he opted to translate the biography of Chinese Premier, Chou-en-Lai that was launched recently along with three of his other books, Rahman said that he had spent 12 years in People"s Republic of China and was inspired by the great statesman. "I felt many people in Pakistan knew Chou but were not aware about the life of this great revolutionary or the Chinese revolution. So I decided to translate the autobiography of Chou-en-Lai and History of China. We live in the midst of a rat race and have lost our ideological base. It"s high time that we make a critical appraisal about the causes of deterioration of the left movement and learn from great revolutionaries such as Chou-en-Lai." "This is more important for the younger generation that has been deprived of its basic rights and is condemned to live in an environment that is hostile and where Kalashnikov culture rules the roost." It"s a delight to see that Rahman has also written and translated books for children. These include 'World of Stories" by Bulgarian writer Angel Karralichev, 'Three Conceited Kittens," a Chinese novel for children, 'Neemoo Keemoo," a short novel for Pakistani children, 'Great Britain," a general knowledge book for children besides some 100 pictorial Chinese book for children. Asked why he chose to translate children"s books, Rahman said that in other countries stalwarts such as Tolstoy and Gorky wrote for the children but sadly enough our writers ignored the genre, therefore, he opted to translate and write for children. "Children are creative and very imaginative. If we can inculcate reading habit in them it would be a great service to the future generation." Rahman was arrested in 1977 and 1978 for the journalist"s cause and was deprived of his job many a time but it has not been able to cow him down and he remains an inspiration for young journalists. Of course, there is much more to this whole issue than just this. One cannot ignore the many consequences of policies followed by western countries -- particularly America -- with regard to the Muslim and Third worlds. The argument that these skewed and often one-sided policies lead to considerable resentment and frustration in Muslim countries against America in particular and the west in general has considerable merit. However, the danger of relying too much on this premise is that it is becomes a convenient way of explaining away all the ills that plague the Muslim world and which are of its own making or whose solutions lie within this community. But this is more of a digression. The matter I want to talk about is quite mundane but affects a whole lot of people -- and unfortunately in a really bad way. It has to do with travelling to the west and involves the now torturous process of getting a visa. Someone who recently applied for a visa to a European country recounts the following. Agreed that it may not sound as harrowing as some of the experiences that one has heard of in recent years but his experience is worth recounting, simply because if the embassies listen to them then perhaps some improvement can be made to improve the quality of the whole experience. He had to apply for a visa for a western European country. Having access to the Internet at home, he was able to download the forms himself. However, there was also the option of filling out the visa application form online. This is what he did, also because he was told by the website that this would allow him to schedule an appointment for submitting the application and hence avoid long lines. He duly filled out the application form online and in the end was asked to take a printout to the visa application centre. He was also sent an email by the country"s visa office section telling him the amount that needed to be paid as visa fee. And since the application had been filled online, the amount was to be paid via a demand draft -- this was also apparently cheaper since a two-hundred rupees charge is levied on all cash payments. Off he went early in the morning, before his work, thinking that he would get done as soon as possible. However, he could proceed no further than the reception at the entrance where an employee of Gerry"s (one of the companies that handle several visa submissions in Karachi) told him that his application could not be submitted because the demand draft that he had got made from the bank did not have the correct amount for paying the visa fees. He told the employee that the amount for the fee had been emailed to him by the country"s visa website after he had filled out the visa application form online. To this, he was told that perhaps the website had not been updated and that he should go and get the draft re-made or pay cash inside when formally submitting the application. Going to the bank was not really an option since it was eight am and banks would not open for another hour. Paying cash also was not an option because he was not carrying so much money on him.Consequently, the whole idea behind submitting an online application did not appear to make too much sense to him. Surely the website should have been updated -- so for no fault of his. He had to now wait and go to the bank from where he made the demand draft (it was a designated branch by the embassy and hence quite far) and come all over again. He did this and went back to submit his application later in the day. Initially it all seemed okay and he went inside, paid cash (better because the fees is linked to the exchange rate and hence could change) and waited to submit his documents. At this stage, however, he says he had no idea whether the woman going through his forms was an employee of the embassy or of the company that runs the visa centre. Furthermore, she kept asking irrelevant questions in that the answers were all contained in the application. Also, he asked her when he could expect the passport back (even official government websites of these countries give a definite timeframe) but he was constantly told 'no idea." He said he asked for the maximum time it would take -- he had to travel pretty soon -- and was told again 'no idea." The friend also says that he was not told about the process that would follow once the application is received and sent to the embassy in Islamabad for processing. Does he get called for an interview and if so what would be the timeframe for this? If there is no interview how does he know that he got a visa or that his application for one was denied? It was only one particularly helpful staff member at the application centre who told him of the timeframe and what to do -- he had to basically track his application and passport himself via a website and a reference number. Only then he would be able to find out when to collect the passport and only then would he know whether he even got a visa. The next day he went on the website as advised and tried to log on using the details given to him when his passport was submitted. He has yet to log on. His other option is to call a 0900 number which costs over ten rupees per minute in the hope that he will be able to find out the status of his application. If a reasonably affluent and education visa-seeker can be inconvenienced in such a way one can only imagine what happens to those who are not so well-off or who don"t have access to the Internet. P.S. : Several people who came to the visa application centre, to obtain a visa form were told that unless they showed a passport they could not be given a form. This detail should have been mentioned somewhere on the notice board of the centre but wasn"t.